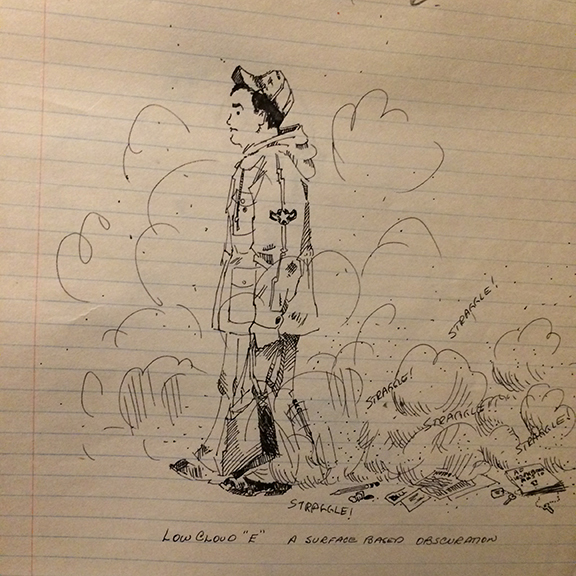 I was recently reminded by Janis (again) of an incident that happened over 45 years ago. 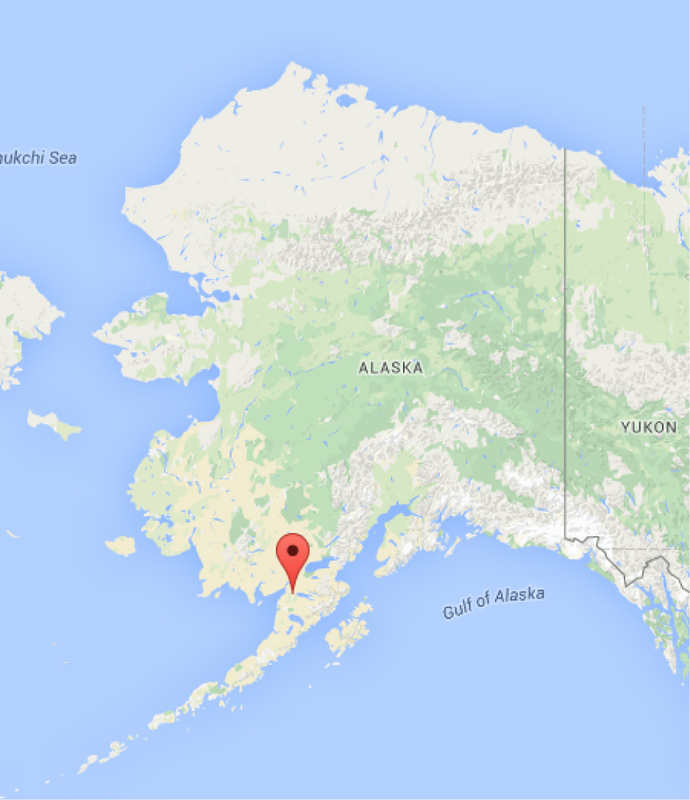 I had received PCS (Permanent Change of Station) orders from George AFB, CA to King Salmon, AK. 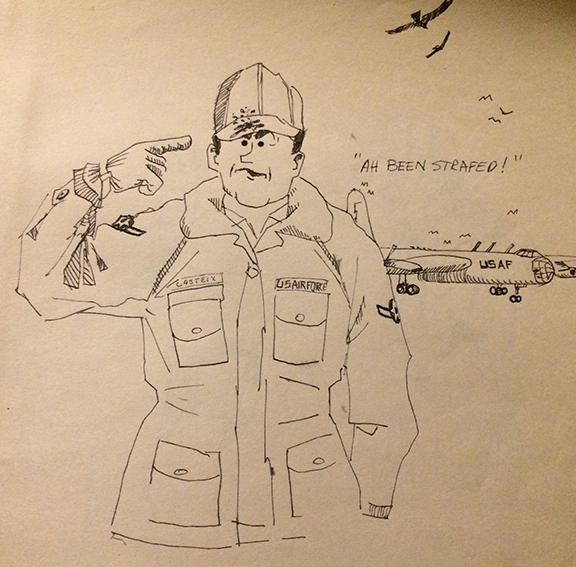 King Salmon AFS was a remote, unaccompanied tour (no dependents) for one year, which happened to be my final eleven months in the Air Force. I made Staff Sergeant (paygrade E5) the first of November. We were leaving on the first of December for leave before I had to report to Elmendorf AFB, AK by the end of the year. I did get to spend Christmas at home that year. 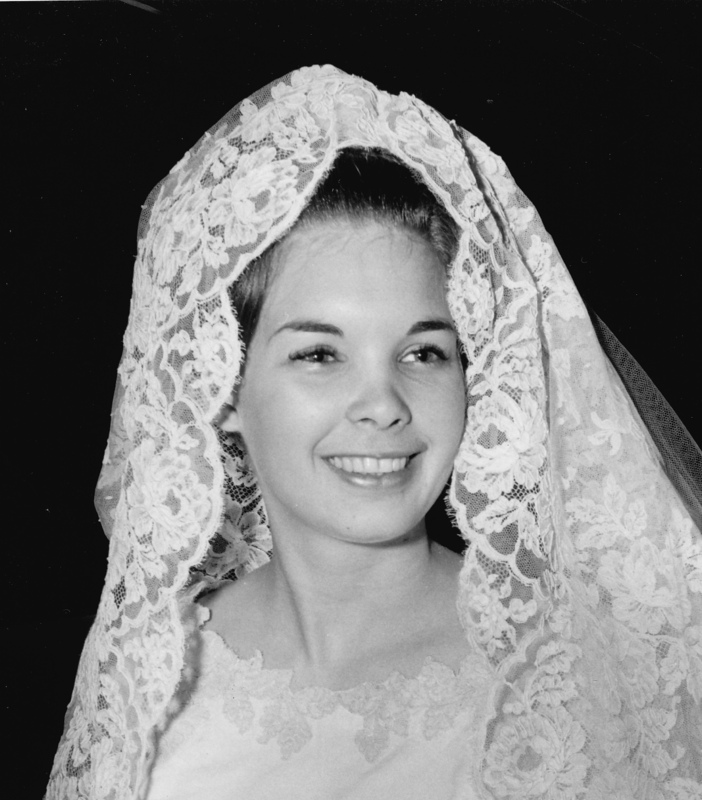 We had driven to California two and a half years before in a red ’68 Chevrolet Chevelle Malibu with all our belongings packed in that car and on top. We looked like a modern version of depression era dust-bowl poor Oakies on the way to California. While packing the Chevelle back in New Orleans, we discovered that boxes take up a lot of valuable space, so we packed much of our stuff without boxes, utilizing every nook and cranny in that car. For months after arriving at George, every time I opened the trunk I would discover some nicknack we had missed unpacking that had vibrated out of some nook or cranny in the trunk. In those two and a half years at George AFB, we accumulated a lot of stuff, more stuff than you can imagine—way more stuff than what would fit in the Chevy Vega we owned then, which was smaller than the Chevelle. We had also “accumulated” a child (Heath) who would be taking up the back seat of that tiny Vega. Heath would get car sick every time he got in a car back then, so we fed him Dramamine the whole trip. Yes, we drugged him. He didn’t puke, but he slept the whole way home. Fortunately, the fact that I made E5 a month before we moved qualified me for the Air Force to pay for moving my household goods (HHG). The movers arrived and packed all the stuff we had in our apartment, and I was still under the 6,000 pounds limit for an E5. The mover asked us if we wanted him to pack the various rocks out on our patio that Janis had collected in our trips out in the desert and the nearby San Bernardino mountains. I’m not talking little rocks here. These were big rocks—watermelon size rocks. 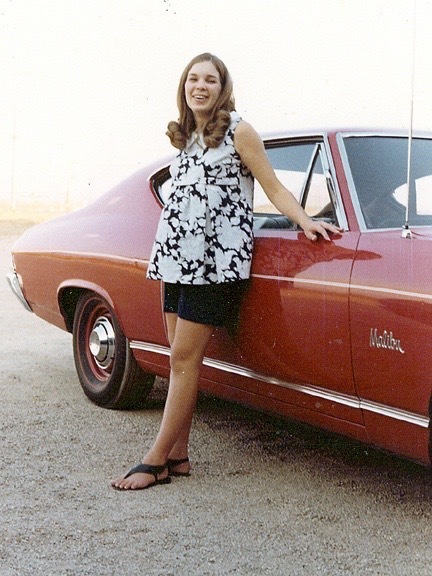 The picture is of that red Chevelle and Janis with Heath (in the oven). I prefer to forget the Vega. I worked in a men’s store part-time while in college and learned many things about the proper gentlemanly dress from another salesman who was a VERY dapper dresser, and the women absolutely loved him. 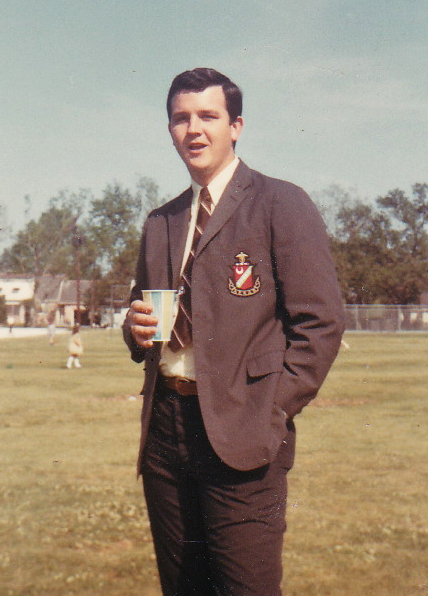 From that experience, I learned about proper trouser length, how much cuff should show from under the sleeves of your coat, proper color matching, NEVER mix patterns (which seems to be de rigueur these days, go figure), and other sundry dressing codes for young men. This carried forward even into my military service. My uniforms were always starched with creases sharp enough to cut thick-skinned tomatoes into paper-thin slices. My sense of style even got me into trouble when I tapered my trousers. My CO obviously wasn’t as fashion conscious as I was, and he made me take the taper out. Even though my business life after the service, I was required to wear suits to work and I even enjoyed it. As the years passed, the dress codes relaxed to allow just trousers and a nice shirt—but no jeans. Then dress-down Friday came along, and “nice” jeans were allowed. As I neared retirement, even jeans became acceptable every day. Ah, the times they were a-changin’. But that excluded wives. Eventually, every married male will, at some time, hear that fear-inducing question from their spouse concerning whatever it is they have on when about to head out for the night’s festivities. It comes in three versions, representing ascending levels of both distaste and threats should the offensive behavior continue. Whatever the level of distaste expressed, they all come at that moment when the spouse steps out of the bathroom fully dressed to the nines and encounters innocent you standing there buttoning the last button on your shirt or tidying up the knot of your tie. Let me expand on this below. Gentlemen, let me clearly state that “yes” is the wrong answer. Don’t waste your time arguing. Whatever you have on must be changed immediately. Gentlemen, a “yes” answer will mean being sent to the couch for at least three nights. Don’t even think of going there, but tuck your tail and find something to wear that she approves of. Gentlemen, a “yes” reply here will ultimately involve lawyers and cost you lots of money—assuming you survive the night. Save yourself some grief and just let her pick something out, put it on, and shut up. I don’t know what happened to our sense of fashion between our early years and retirement, but we obviously lost it along the way. At least, that’s what my wife tells me whenever I attempt to dress for some social event. Remember back eight weeks ago I posted about my grandson going off to Air Force Basic Training? It is now eight weeks later and here he is. 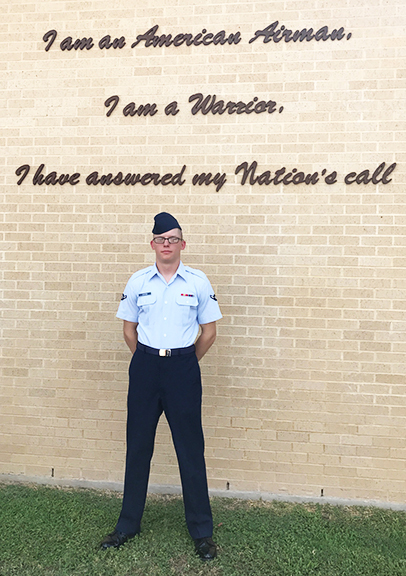 Janis and I drove over to Lackland AFB in San Antonio, Texas, to be there for Blake’s graduation from basic training. It was a grueling trip that was supposed to be about eight hours that turned into more than ten with several periods of stop and go traffic—an hour and a half just to get through Houston! It was an intense and emotion-filled weekend as we joined his parents, his sisters, and some cousins as well as an aunt and another grandmother. 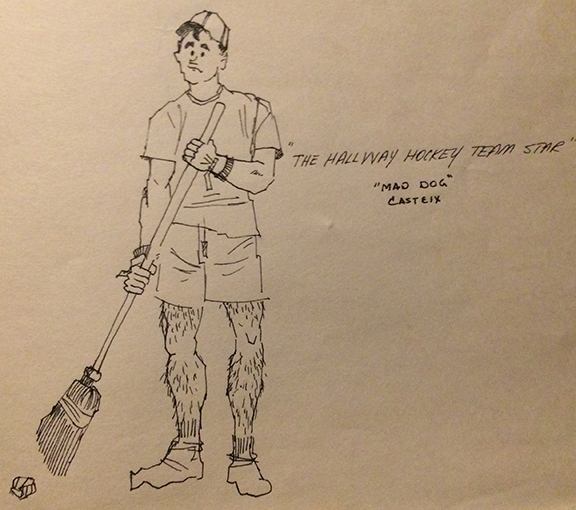 Having done my basic training at Lackland back in December 1968-January 1969, I found it particularly moving. This was especially so because Heath, my son and Blake’s father, had also been there a few decades after me, in 1996, when he did his basic training at Lackland. 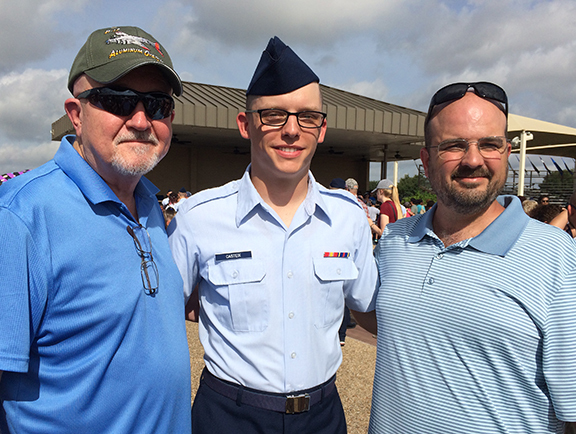 Three generations of Casteix men in the Air Force. The three of us are in the pic below. Blake will next be going to NAS Pensacola for training in “Non-Destructive Inspection”. That means he will be inspecting aircraft for structural integrity, and the testing involves non-destructive processes. It is a highly technical field. Interestingly, Heath has his own business doing aircraft airframe repair and then FAA certification of the repaired parts. He learned that trade in the Air Force. Later as a civilian, he took training in what Blake will be doing, and his business is also a FAA certified NDI inspection station which has more business than he can handle. That means Blake will have a job waiting for him when he gets out. I guess you have figured out by now that we are all very proud of Blake. A point I would like to make in closing is that “education” need not always mean college, and success and financial security need not require a college degree. Heath makes a lot more money than I did at this point in his life. I am of the opinion that many kids in college today are wasting their money and would be better served by military training or a good trade school. Unfortunately and incorrectly, that sometimes carries a negative stigma for some people. I HATE flying and refuse to get on a plane unless I have no other viable choice to get from point A to point B. In most cases, I will drive before I will fly. No, I am not afraid of flying. I have many hours in many different types of aircraft. In civilian life, I have flown in many of the big commercial planes, both prop and jet, enough that I earned sufficient points to upgrade to first class on the return trip home from my business trips. I even had a couple of helicopter rides and a flight in a single engine Cessna that was dropping skydivers back in the sixties. 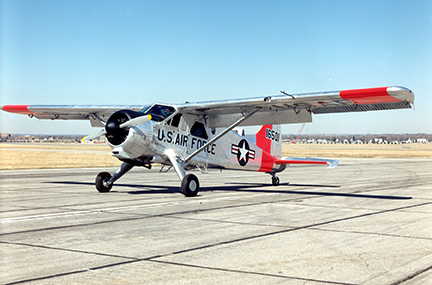 In the Air Force, I flew more civilian flights for training schools or TDY deployments, plus trips in Huey helicopters, six-seat U-6 Beavers, C-130s, one of which was ski-equipped landing in an unimproved runway, and even a seaplane landing on a lake once. I almost had a ride in the back seat of an F-4 Phantom II as an “atta-boy” award. That would have been fun. Even been involved in one minor “crash”, which I wrote about here. So it isn’t like I have not been exposed to flying. 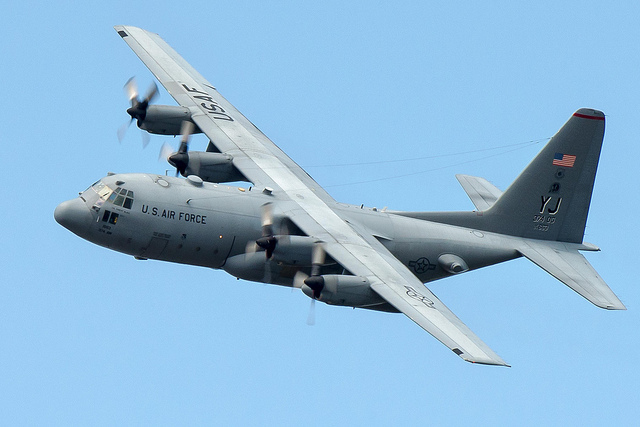 I used to enjoy flying, even the nine hours I spent in the cargo hold of a C-130 coming back from Alaska. (I was on leave and grabbed a “space-available” flight out of Anchorage with some Ohio Air National Guard types returning from summer camp.) In spite of the canvas jump-seats and loud interior of the C-130, I actually consider that to have been more comfortable than having my knees crammed into my chest on a modern commercial flight. And the “boxed-nasty” they gave us for lunch on that C-130 flight was better than what you get in today’s commercial flights. I hate flying because the experience has become a miserable affair for me. Some of that is because of those lovely folks who brought us 9/11 and the government agency that sprang from that (TSA) with all their silly efforts to make us think we are safe. I mean, really—patting-down a five year-old girl or a 90 year-old grandmother is going to protect me? Or my favorite, the Muslim garbed TSA agent patting down a nun. Give me a break! To go almost anywhere by air today, you will at some point be routed through a “hub.” That involves a layover of an hour or more—better make it “more” to cover for flight delays and weather. I once missed a connection (last flight of the day to NOLA) because of weather and spent the night in the Atlanta airport to catch the first flight out in the morning. Lovely experience. At least they don’t close the terminal at night. On that C-130 flight from Alaska, it landed in Toledo, Ohio late at night. The airport was joint-use with the Air National Guard on one side and the civilian part on the other. By the time I got there, the last flight for NOLA was long gone, and they were locking up the terminal for the night. I begged, and they agreed to lock me inside rather than go search for a hotel. It was actually a better experience that the one I had nearly 30 years later in Atlanta, because I was much younger then, and there was no CNN blaring its propaganda all night long in the Toledo terminal. I used to do a lot of business travel, and to go to Kentucky on business, I had to arrive at the airport at least two hours before my flight, fly to Atlanta (or Cincinnati), lay-over, fly into Louisville, rent a car and drive to Frankfort. I can actually drive from NOLA to Frankfort in about the same time all that takes and with easier pee stops, infinitely better food, and in considerably more comfort. And when the meetings are over, I don’t have a mad dash in five o’clock Louisville traffic to catch my flight. Less anxiety. Airlines have squeezed the customer out of every last dime, charging or proposing to charge for what was formerly included in your ticket cost. Meals? Forget it. Either buy something in the airport or make do with a small bag of pretzels. Seat comfort? Forget that. They have added rows both ways. You get to share that armrest with your neighbor (better hope it is a skinny woman), and when the guy in front reclines his seat, it will be right into your kneecaps. Reclining yours moves you to an awkward contorted position from which sleeping is possible only for those who have been without sleep for at least the last three days. Now I hear one airline is offering (and I use that word very loosely) a special lower rate with even less legroom, and the seat doesn’t even recline. Oh, and no carryon. You must check even your computer. Not gonna happen for me. Overbooking – I understand they want to fill the seats of no-shows—milk every penny out of that flight— but aren’t those seats already paid for by the no-show (or his insurance policy)? Isn’t that double-dipping? Standing with hand-straps like on the subway is next. Not for moi. Flying has become a form of self-abuse that I refuse to submit myself to unless I have no other choice. That takes a trip to Europe off the table for me. Comments Off on Why I Hate Flying. I usually worked mid-shifts. That is from midnight to 0800. I liked mids because they were usually quiet. Unlike my previous assignment at George AFB, California, which was in the middle of the Mojave Desert and void of any weather most of the time, AKN was a busy little weather station. We got lots of snow, rain, wind, and fog depending on the time of the year. On this mid-shift, it was a cold and a relatively weatherless winter night with clear skies and unlimited visibility. From my reclining desk chair with my feet propped up on the equipment console and with only minor swiveling, I could easily see about 250 degrees of the horizon, and nothing was happening. The neighborhood bear had already made his rounds of the village garbage cans and had passed the ROS (Representative Observation Site – the weather station) moving on to fresher cans on the south end of the runway. On this quiet night, I had been writing a letter home with occasional glances at the horizon I could see. About fifteen minutes before the hour I stood to walk out onto the catwalk surrounding our second floor perch we called the ROS to take my required hourly observation, and low and behold what do I see on the moonlit horizon that had been hidden from my casual view by the weather console, but FOG! Lots of fog! A solid wall of fog moving toward the station. Station visibility is calculated by the visual sighting of certain landmarks at a known distance from the station and was suppose to represent over half of the horizon circle. Well, one half of the horizon circle was rapidly disappearing as that fog bank rolled silently and relentlessly toward me. I was scheduled to take an “hourly” observation, encode that, and transmit it on the hour. If certain conditions regarding weather, winds, visibility, or cloud cover were met that were clearly spelled out in standard operating procedures (SOPs), I was required to take an abbreviated “special obs” (special observation) and transmit that. And some of those “certain conditions” were being met as I stood dumbfounded looking at that fog bank. I promptly took a special and transmitted it and then immediately went back to completing my hourly and transmitted that. The fog rolled relentlessly on and was enveloping the station. Visibility was rapidly dropping, requiring another special, and that was followed by another almost immediately. In about 15 minutes, AKN went from clear and unlimited visibility to a condition, in weather reporting parlance, called “WOXOF.” Translated: zero feet visibility and zero feet ceiling in fog. AKN, as an airport, was effectively shut down. With my weather observations and reports reflecting current conditions, I stood there surrounded by gray nothingness and tried to calm my rapidly beating heart. That’s when the phone rang, and that would be the duty forecaster back at Elmendorf AFB in Anchorage, and he wanted to know what the hell was going on? “You should have warned me it was happening. You blew my forecast!” he fairly screamed. I didn’t say it but was thinking, I didn’t create this soup. Maybe it was you who blew the forecast? That was life for weathermen in the wilds of Alaska in the winter, but there is another story I want to tell. It also happened on a mid-shift and during another period of WOXOF. Several airmen from the King Salmon AFS decided to walk to Naknek, which is a little fishing village few miles up the road. The night was very foggy, and along comes a local in his car hauling down the gravel road and hits one of the walking airmen. And he was hurt badly, bad enough his injuries were potentially fatal and beyond the equipment and skills of the “docs” at AKN who were really Air Force trained medics. Evacuation back to the hospital at Elmendorf AFB was called for, and that meant by air, as there was no other way. A crew was pulled together, and the four turboprops of a C-130 were fired up at Elmendorf. They arrived at AKN with WOXOF conditions at the station. Normally, that would have meant no landing would be attempted for safety reasons, but this was an emergency. A man was badly hurt and might not live without the care he could get only back at Elmendorf. The air traffic controllers at AKN attempted to guide the pilot down for a landing using the GCA radar (Ground Controlled Approach). They watched the GCA screen, told the pilot what to do, and he listened and did as they said, because he could see exactly zero. He was making a blind approach in the dark at an airport with the ceiling and visibility both at zero and trusting the training and judgment of a three-striper staring at a blip on a radar screen. The pilot was instructed by the controller to tell him as soon as he saw the approach lights, and these are VERY bright strobe lights. He didn’t see them even though the GCA indicated he was right over them. “Execute missed approach and try again,” he was told. The pilot powered up the four engines of the big cargo plane and climbed back up to go around for another attempt. The controller clearly heard him as he flew passed halfway down the runway where the GCA radar was located. The pilot brought the C-130 around for another GCA approach and was talked down by the controller watching that blip that represented that plane on the radar screen. Again he was told to tell the controller when he had the approach lights or the runway in view. That was followed by silence for a moment or two. “Too late. I’m on the ground,” said the pilot as the controller heard the plane with its prop’s blade pitch reversed and four engines screaming to stop the C-130’s roll down the runway. 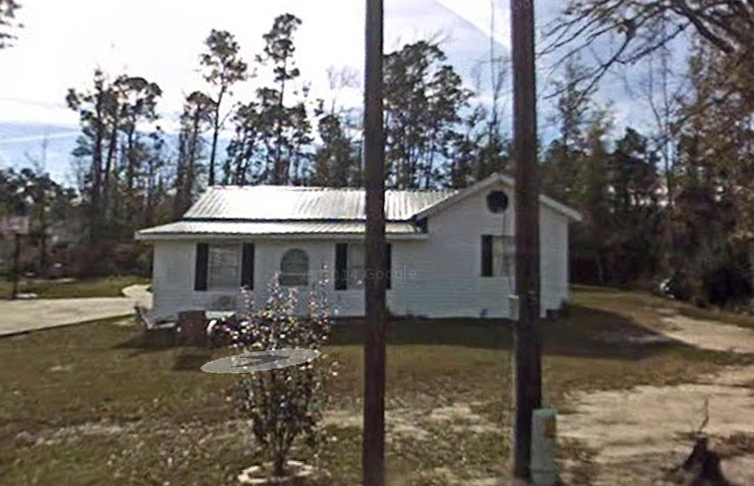 In this blog I have mentioned Waveland, Mississippi several times. In fact there is a whole category for “Waveland” here. It holds many memories for me and my two sisters as well as our cousins Melanie and Bobby. I stumbled upon this image on FaceBook and it inspired me to write a little about Waveland. As I mentioned in one of my previous blog posts on Waveland, we had a house there on the north side of the tracks. MB and his friend Pete built it on weekends and summer vacations from material they salvaged from a house they tore down in New Orleans. It wasn’t anything fancy, three bedrooms, one bath and a kitchen/living room combo with a fairly large screened porch on the front. 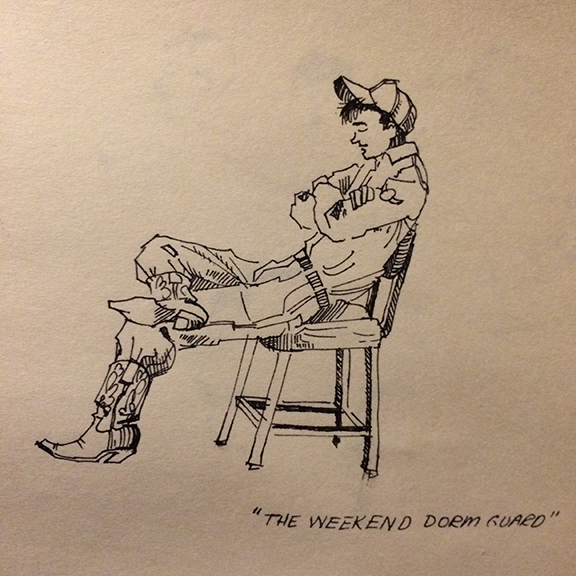 In the summer, I slept out there under the blast of a huge window fan sucking air out of the house and across me in the top bunk of the bunk bed. I LOVED sleeping there. In the winter I moved inside for obvious reasons. We fished, and crabbed, and swam, and floundered, if you can call it that, and explored the endless woods surrounding the house. It was the greatest place in the world for a boy to grow up. I so miss Waveland. My biggest regret in life is we were never able to afford a place like Waveland to take my boys in the summer. We kids would sometimes walk into town to do whatever it is we did in the metropolis of Waveland. The route was along the railroad tracks. One time, we took Michael Manard with us, and he was quite young. Why we did this, I don’t recall, but Melanie might, because she tells this story on occasion. But we left Michael hiding the the culvert of the railroad while the rest of us went into town. Very responsible, weren’t we? 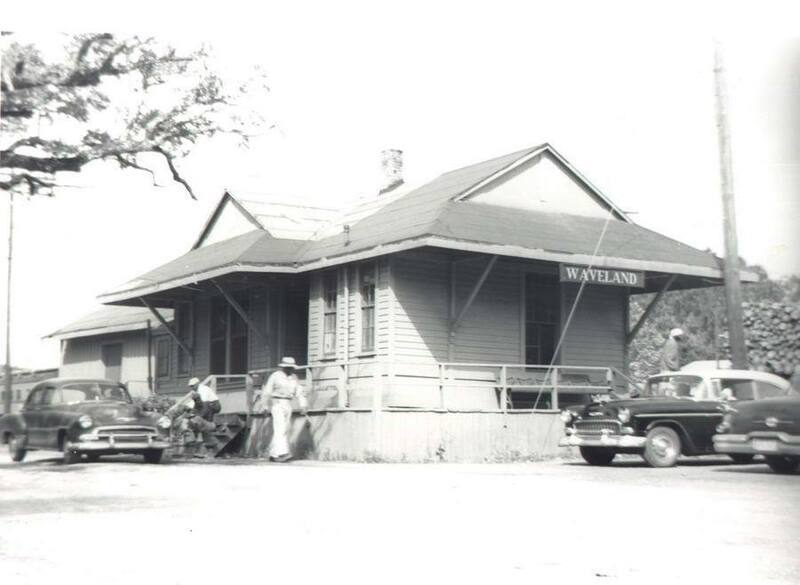 The image of the Waveland train station reminded me of a story MB used to tell. Before the war and before he lost his “fortune” in the Depression, Martial, MB’s dad, would lodge his family in Waveland in a rented house along the beach. They would remain there all summer. It was fairly common for New Orleanians in those days, those who could afford it, to move out of the city during the hot summers (no AC back then), and places like Mandeville and Waveland were popular destinations. Waveland was an easy choice because it was so convenient to New Orleans, and I don’t necessarily mean by car; I mean by train. During those summers, Martial would depart Waveland for New Orleans by train on Monday morning and tend to his businesses in NOLA all week long. He owned eight drug stores in New Orleans back then. On Friday, he would catch the train and get off in Waveland to rejoin his family. MB would sware they weren’t wealthy, and I am sure, during the Depression when Martial lost most of his holdings, this was true. But before that, they lived a lifestyle that bordered on wealthy, probably upper middle-class when there weren’t a lot of people who could claim such status. Waveland fell into disuse during the sixties and early seventies. I was either off in college and working out of town during the summers or in the Air Force. My sisters often had other interests, and MB sold Waveland in 1973 or ’74. My sisters and I briefly considered buying it. 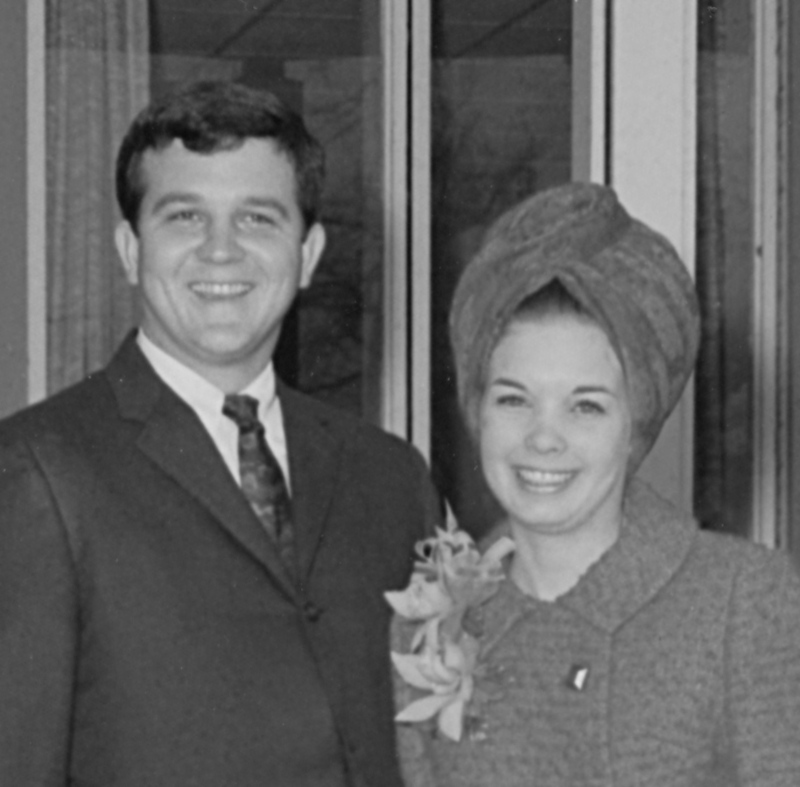 I was recently discharged and barely making a living, and Jeanne and Martia weren’t any better off financially, so we backed down, and Frank Cavalino bought it. We made one last trip to Waveland to collect our stuff before Frank moved in. 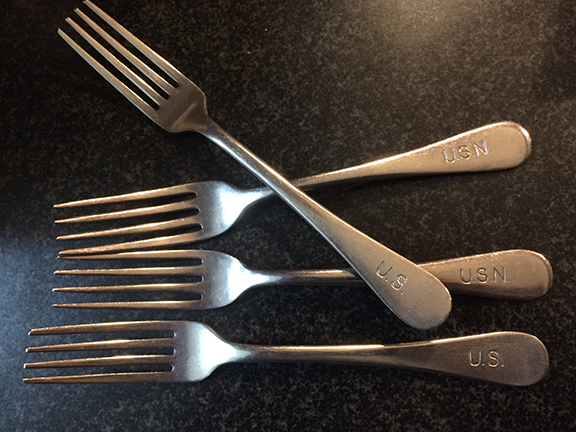 I got the stainless dinnerware from there, all war surplus and marked either “U.S.” or “U.S.N.” We use it as our everyday ware today, and every time I sit down to dinner, I am reminded of Waveland. I also got the Coca Cola bottle opener off the wall. (MB was not happy I did that.) I opened many a bottle of “pop rouge,” or Seven-Up, or Nehi Sodas on that opener. 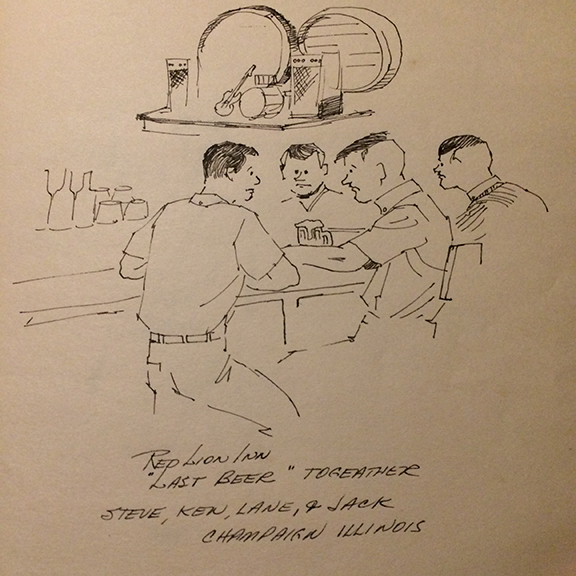 It resides on the inside of the door of the antique, oak ice box I converted into a bar, and I think of Waveland every time I open that bar to get something out. Image is clipped from Google Street view. The house is still there, and a neighborhood has grown up around it. I drove past once about ten years ago. The owners have closed in the porch, and all the pine trees are gone, probably taken down by Camille and Katrina, leaving the house looking a bit forlorn. I experienced mixed emotions that day: sad because it isn’t mine or even like it was when it was mine, and happy for the memories it brought back. 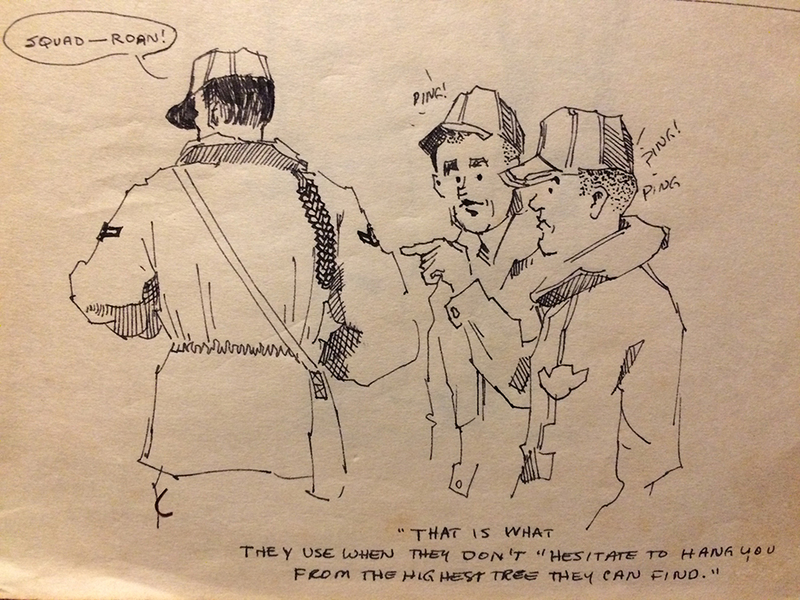 What I Did in the War – Observed Weather. That is what I did in the Air Force for four years. Don’t laugh. Lots of your tax dollars went into training me and my fellow weather observers. And it isn’t as easy as it sounds. We didn’t just stand around all day gazing heavenward through our AF issue sunglasses. Yes, they actually did issue us sunglasses. How cool was that? Just what did we do you ask? We observed weather and recorded it on a form WBAN10 (pronounced “way-ban ten”), encoded it, and sent it out over teletype every hour, sometimes more often if changing conditions met the criteria for a “Special Observation.” The data included cloud cover layers, height and amount, surface visibility, weather (if any), altimeter setting, temp, dew point, winds, barometric pressure, and lots of supporting comments when necessary. This information was sent out all over the world for anyone to use. What else did we do? Depends. Some of us, like moi, got to go temporary duty (TDY) to a place like Cuddyback AGGR (Air to Ground Gunnery Range) in the middle of the Mojave Desert. At Cuddy we supplied surface observations (obs taken at the ground level) and winds-aloft obs (wind speed and direction at 1,000 foot intervals above the station). The latter involved launching a 1,000 gram helium-filled weather balloon called a PIBAL (pilot balloon) and tracking it with an instrument called a theodolite, recording azimuth and elevation angles at one minute intervals, plotting those and deriving wind speed and direction at various altitudes above the station. The AF found this helpful for calculating bomb trajectories, and Cuddy was a bombing range. (I guess the AF just “winged it” when they had to drop real bombs on the enemy and no AF weather observer happened to be hanging around the target area taking PIBAL obs?) The U.S. Army also found it useful for calculating artillery trajectories. Winds aloft can seriously affect where a 155mm shell lands 20 miles away, which could be meaningful to friendly troops on the ground near the target. Very generally speaking, most weather observers had two main operational environments. 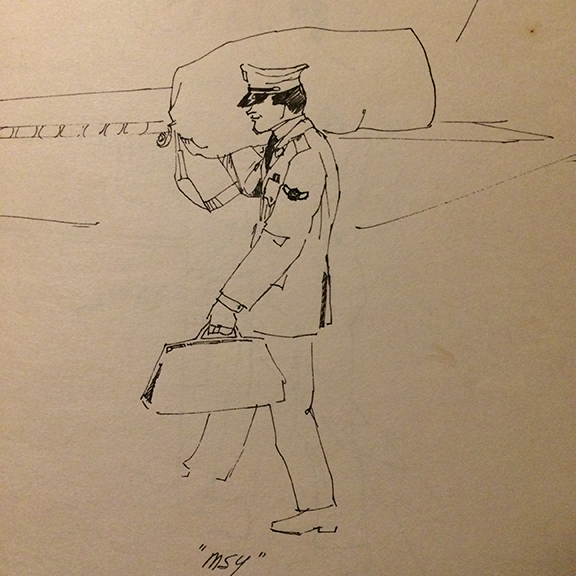 The first being in Base Weather, usually housed with Base Operations. This is where the pilots came for weather briefings and filing flight plans. The place was (in my day 1968-72) cluttered with all manner of weather maps and bits of teletype paper torn into strips according to their source and content and posted on clip boards for the duty forecaster to use. That was the olden days; they use computers now. 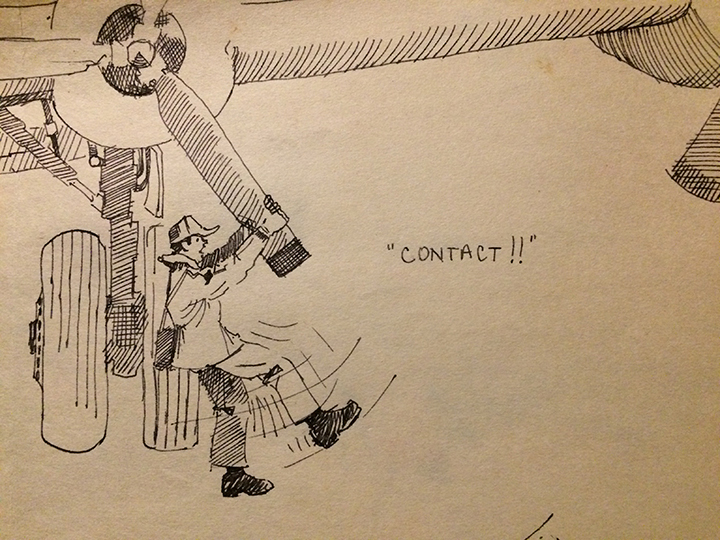 The observer mainly supported the forecaster and his job of creating forecasts for the station and briefing pilots. The second duty station was the representative observation site (ROS). They were usually located out along the main runway to collect data closest to where it would be used. The observer worked alone out there and took observations and transmitted them as described earlier. Weather observing was actually a great job, but it had its negatives. 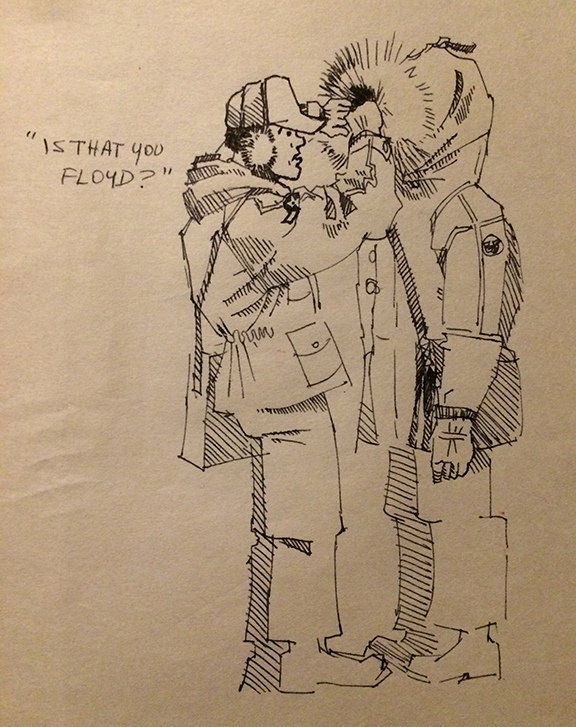 Aside from doing two week TDYs at places like Cuddyback, the AF had a need to collect weather observations from some very remotely located places, like the wildernesses of Alaska. These weather stations were located at AF radar stations in the middle of nowhere again. The observer would find himself with usually less than 100 other lost souls at a station in the Alaskan wilderness hundreds of miles from anything remotely resembling civilization (meaning no McDonalds) and the only way in and out was by AF planes, which had to be ski equipped in the winter. I was at one of those, King Salmon AFS, but it was larger (about 200 lost souls) and had a paved runway. That was because it was the home of armed interceptor aircraft standing by to scramble against any Russkies who might get frisky and violate US air space, which they did fairly often to test our defenses and response times. 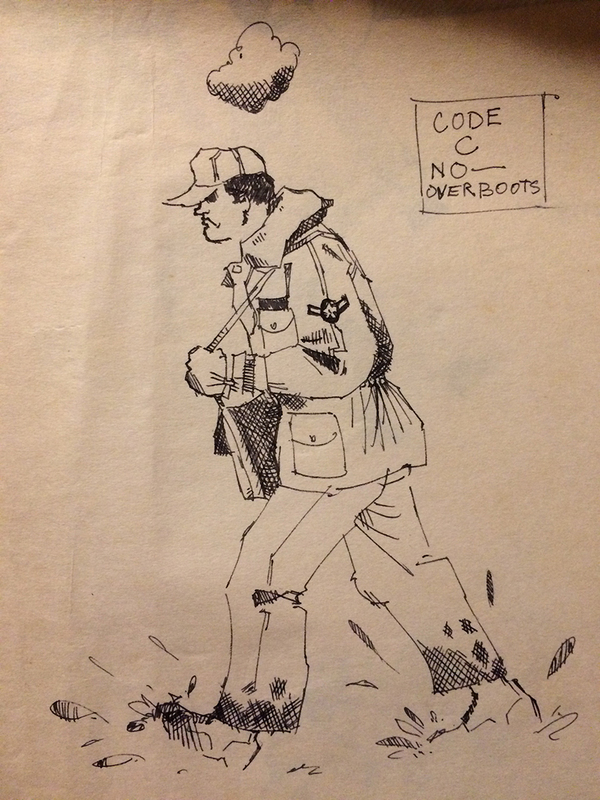 Another drawback was the U.S. Army had a need for weather data to conduct field operations, especially those involving helicopters and artillery, but they maintained no weather services. Guess who supplied that? Yep, the Air Force. An observer could find himself assigned to an Army unit and in the field with said unit being shot at. Thankfully, I managed to avoid that aspect of the job. The book Seeing the Elephant by Dave Hornell does a good job of describing what that was like in Vietnam. It is also a humorous read. Back in the day, during your four-year commitment, most observers would spend at least one of those years at a remote assignment like Alaska, Greenland, Iceland, Korea, or SEA (Southeast Asia – Vietnam or Thailand). Mine was Alaska, which was not bad if you like to hunt and fish like I did. I just missed a trip to SEA, Thailand to be specific. During my last year at George AFB in California I was assigned to a Bare Base Mobility Team, which was an early version of a rapid deployment force. The team was designed for “bare base operations,” which assumed there were airfields all over the world, either active or not, that could support air combat operations on short notice. We were supposed to have our duffle bags packed and ready to deploy. Upon notice, we would report, draw field issue, including weapons if necessary, and be on a C-130 for somewhere to marry up with our MMQ-2 mobile weather van upon arrival. Security, air traffic control and weather observers were the first to arrive at the new base, which was expected to be conducting air combat operations within 24 hours of our arrival. While I was on a plane headed for eleven months of fishing and hunting in King Salmon, our team was activated and sent to Thailand for a year. Whew! Another nice thing about duty at King Salmon was it was a joint-use airfield. The civilians were on one side, and the AF was on the other. FAA supplied administrative people, the Weather Bureau supplied the forecasters, and the Air Force supplied air traffic controllers and weather observers. Since I worked with Weather Bureau civilian forecasters for the whole eleven months I was there, I never put on a uniform except to get paid and travel on leave. 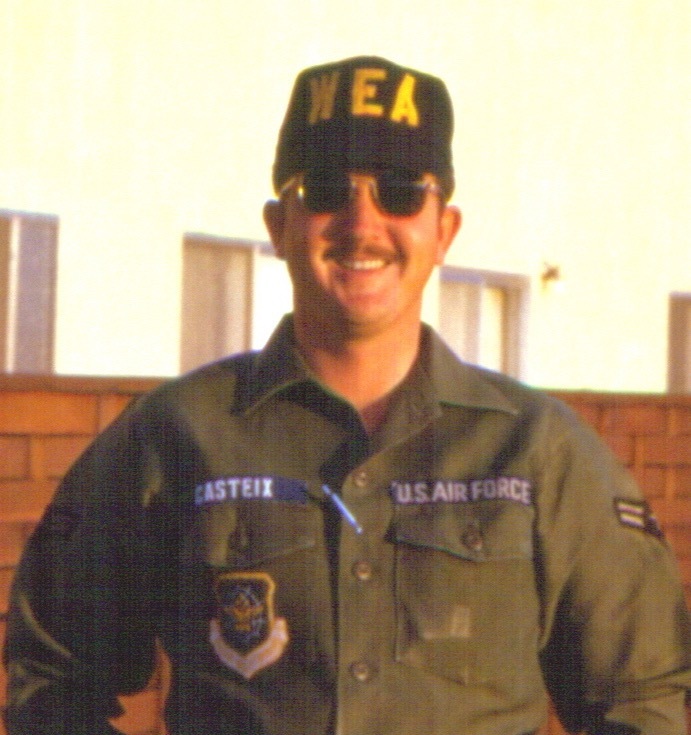 All in all, my Air Force service experience was not bad, especially considering the Vietnam War was going on. The work was interesting and frequently challenging, plus I got to meet a lot of great people and visit places I never would have otherwise. 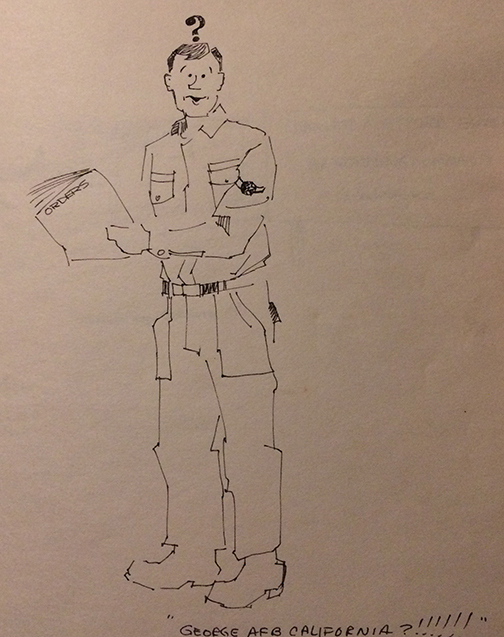 Comments Off on What I Did in the War – Observed Weather. Three Strikes and You Are Out! 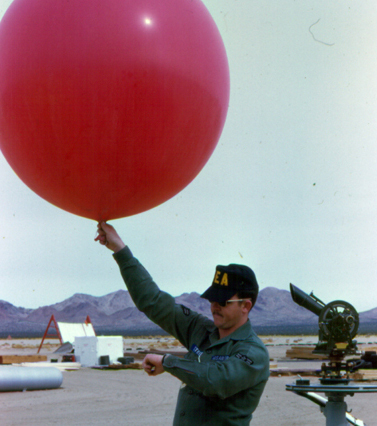 While stationed at George AFB in Victorville, CA as a 25251 Weather Observer, I was often sent on two-week TDYs (Temporary Duty) to Cuddyback Air to Ground Gunnery Range about 60 miles north of George. Cuddy was quite literally in the middle of nowhere. It was a dry lake in a shallow valley hemmed in by low mountains. As a weather observer, it was my job to supply winds-aloft observations for the pilots to use in judging their bomb trajectories and strafing runs. To calculate winds aloft we launched a 1,000 gram balloon and tracked it with a theodolite, taking elevation and azimuth readings every 60 seconds. All this was explained here if interested. To get to Cuddy you had three choices: drive your own POV (privately owned vehicle), which would leave Janis without a car for a week at a time, or arrange for Motor Pool to drive you up Sunday night, the most common method, or take the air taxi shuttle Monday morning. The shuttle flight usually left too late for the observers to use it. We had to take our first winds aloft and surface obs (observations) at least four hours before the first mission arrived over the range. The RO (range officer) used the air shuttle and arrived only an hour or so before the first mission. When I first arrived at George, they were using a single-engine, de Havilland U-6 Beaver, which is built in Canada and commonly used by bush pilots in both Canada and Alaska. The U-6 was a six-seater (five passengers plus the pilot). For some reason I can’t recall, I was taking the U-6 up on this particular trip to Cuddy. We take off and in only a few minutes (60 miles, remember) we are letting down onto Cuddy’s paved runway. All seemed to be going smoothly, “seemed” being the operative word here. I had watched many U-6 landings while up at Cuddy, so I knew what to expect. The parking apron, which is right in front of Cuddy’s tower, is about half way down the runway. The U-6 is a STOL aircraft (Short Take Off and Landing), so it normally uses barely half the runway and pulls right into the parking apron. We touch down and the parking apron is coming up fast. I am thinking, How is he going to slow this thing down soon enough to be able to pull into the apron? Short answer: he wasn’t going to make it, but not for want of trying. The pilot hit the breaks and starts his turn, and we zip right through the parking apron and spin off into the desert, like a 360 degree spin off into the desert! Swell! Just get me off this plane! I should have learned my lesson. I didn’t. About a year later, they replaced the U-6 with a UH-1 Huey helicopter, and even though the Huey would not be my first helicopter ride, I had to try that puppy. So, I sign up for another Monday morning milk run to Cuddy in the Huey. The RO and I are all loaded in the Huey waiting on the pilot to board and light up the turbine engine. I got suspicious this lark of a trip might not be such a good idea, because I am watching the pilot and the crew chief have an animated conversation involving lots of arm waving and finger pointing, mostly in the direction of the Huey I am sitting in. Eventually, we took off and made the trip without incident, like crashing or something. Later that day while having lunch in the chow hall, I heard some of the Cuddy regulars talking about how they had grounded the Huey because of engine issues when it got back to George. Three strikes and you are out? I used motor pool for all my trips to Cuddy after that. Comments Off on Three Strikes and You Are Out!